Don't miss the first performance in this new theatre, The Wider Earth tickets are available now for its limited 2-month run! 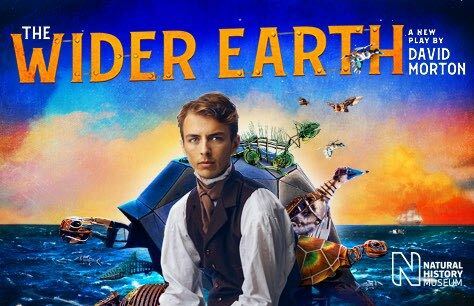 A new theatre in the Jerwood Gallery at the Natural History Museum has been unveiled for the European premiere of award-winning drama The Wider Earth. The play, about the story of a young Charles Darwin, is running for a limited season. Get The Wider Earth tickets now and share the wonder of discovery in the Natural History Museum's Jerwood Gallery. The show is suitable for children aged 8 and over. The puppetry and visual elements will appeal to younger people, but some of the scientific content may go over their heads. Please note the production is not suitable for children under 3 and babes in arms, who will only be admitted at the discretion of the theatre staff. 2 October 2018 - 24 February 2019. Please note this production contains strobe lighting and loud noises. Decided to watch this show on the off chance and we were thoroughly surprised. A great show and some very energetic performances.